British heavyweight champion Hughie Fury has dismissed the notion of him fighting his cousin Tyson Fury despite the lineal heavyweight champion’s high profile split from his trainer and uncle Peter Fury at the end of last year. 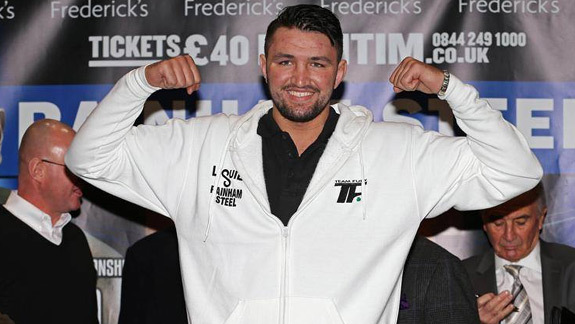 In an interview with The Mirror Hughie revealed that he has barely spoken to his cousin since the split but ruled out a fight with Tyson, 25-0 (18), who is scheduled to return to the ring on June9 at the Manchester Arena against an opponent to be named. “I definitely wouldn’t fight him,” said Fury, 21-1 (11), whose lone career loss came to New Zealand’s Joseph Parker on points in a fight for the WBO world heavyweight title last September. “I wouldn’t lower myself to that level. Family is family, even if you don’t speak. You don’t put yourself in the ring just for money. Fury, 23, claimed the national crown on Saturday night with a fifth round TKO of Sam Sexton 24-4 (9) at Bolton Whites Hotel in Bolton, Lancashire. The 33-year-old from Norwich was making the first defence of his British title. Fury says he wants a crack at WBA, IBF and WBO heavyweight champion Anthony Joshua, 21-0 (20), but he might have to take a number with WBC champion Deontay Wilder and Russian mandatory contender Alexander Povetkin lining up to get their chance to fight the English moneyman. “Those are the fights I want,” said Fury, who surprised many with his stoppage win of the experienced Sexton on Channel5 in the UK.